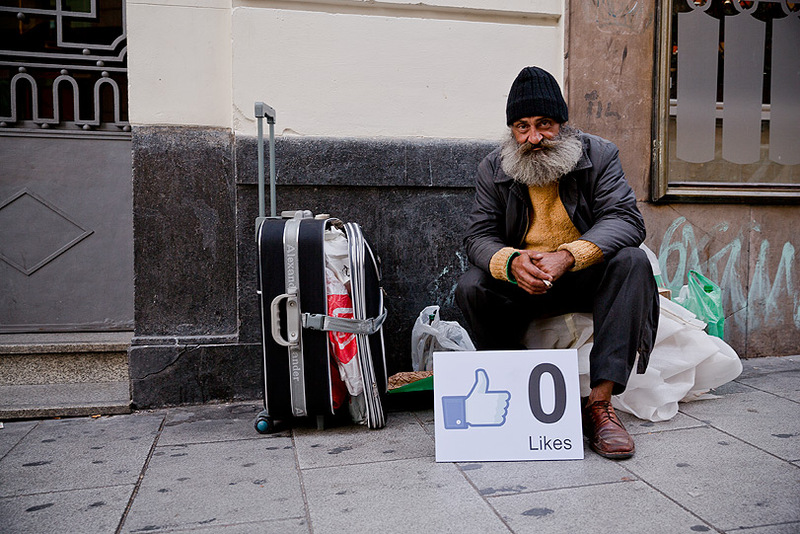 SpY is an urban artist who has been practicing forms of intervention, mostly traditional graffiti, since the mid-1980s. More recently, he has chosen to work within the confines of urban elements, often playing with their intentions and using them as a “palette of materials”. 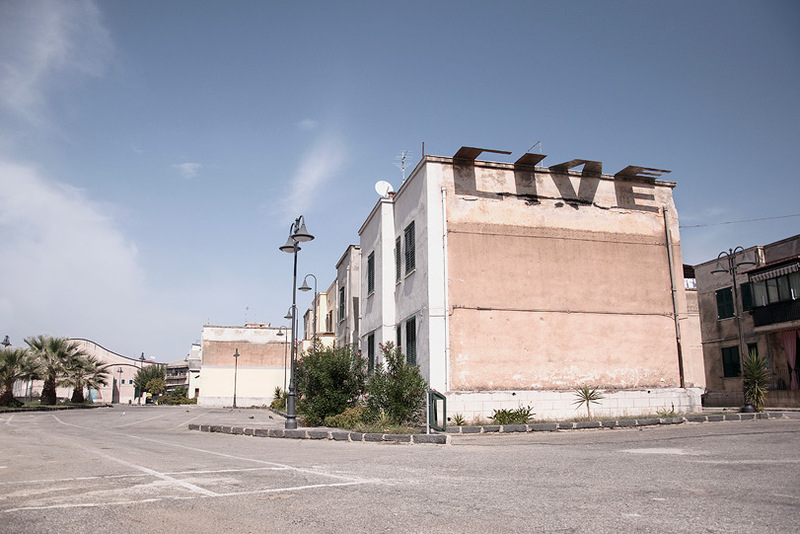 I suggest checking out this book for a nice overview of urban intervention art like this. Much of it has a strong element of humour, wit, or playfulness. To me, the strength of this type of work lies in its ability to ambush your everyday life, disrupt your routine, or at the least, make you reconsider what the things around us are made of. 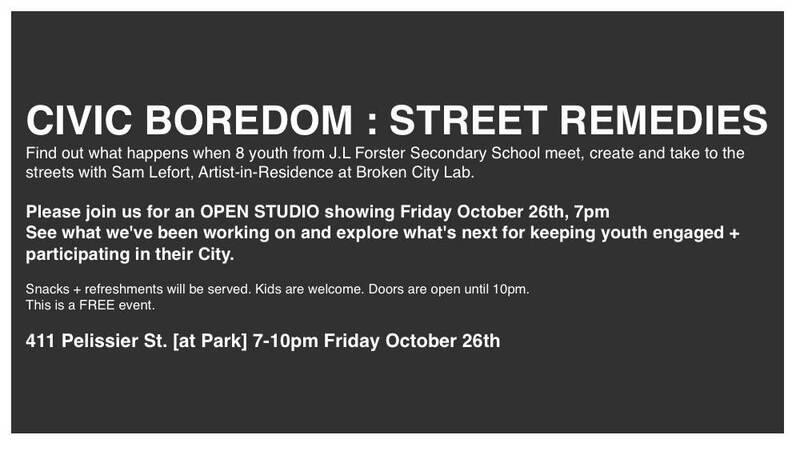 Mark your calendars for Friday, October 26th at 7pm for an open studio of our artist-in-residence, Sam Lefort. You’ll remember Sam from earlier in the summer when she hosted a rapid fire series of workshops on urban ecology at CIVIC SPACE. 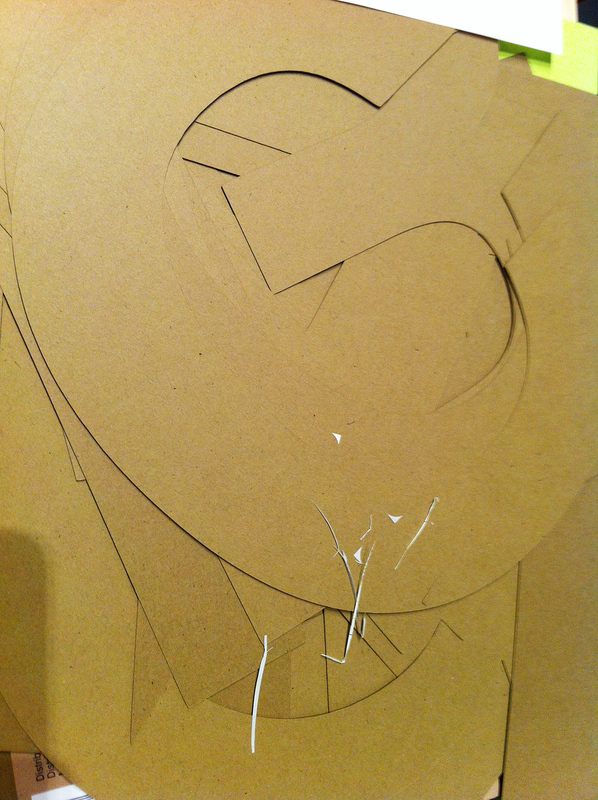 She’ll be presenting a new project realized over the course of her residency in collaboration with students from J.L. Forster Secondary School. You’ll have a chance to meet Sam and the students! The project, CIVIC BOREDOM: STREET REMEDIES, features a series of temporary street art stencils installed around the city. Working through a series of workshops with Sam, the students created powerful text-based visual statements that will get residents and visitors starting to think about issues impacting youth. 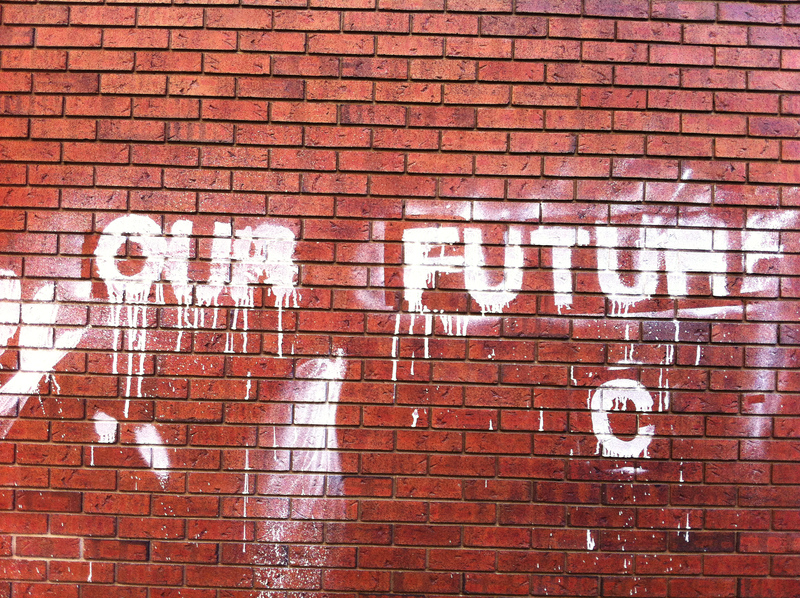 Using custom card stock stencils and environmentally friendly, hand-made chalk paint (corn starch and water), students made their marks (temporarily) around downtown Windsor to try to bring some attention to their hopes and concerns for their futures and the future of the city. Here are just a few of the installations around the city. 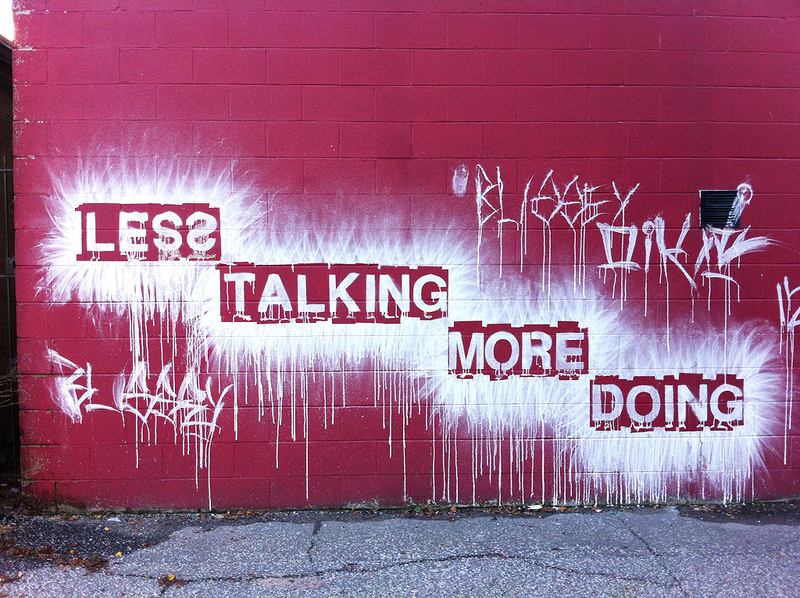 LESS TALKING MORE DOING. 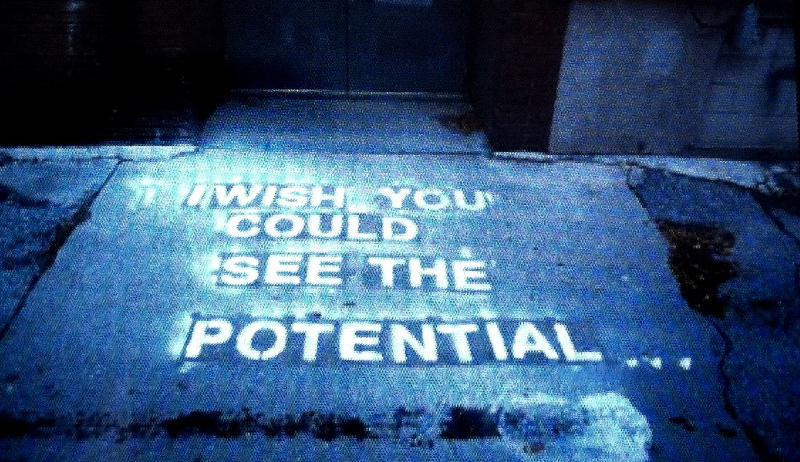 I WISH YOU COULD SEE THE POTENTIAL. 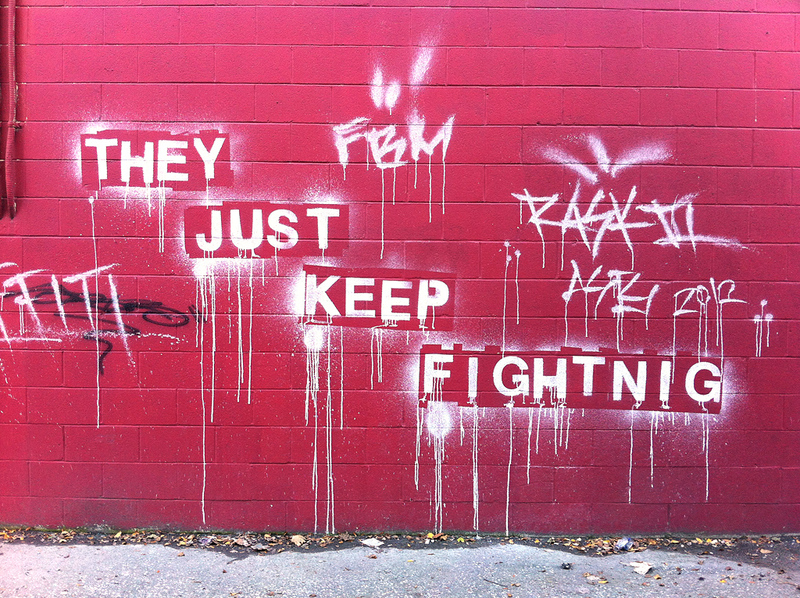 THEY JUST KEEP FIGHTNIG (sic). This week I decided to do something productive in my spare time and I ended up with this! I made some message boxes and put them around the city. These boxes work much in the same way that those numbered tickets at the deli do. However, instead of pulling down and getting a number, the strips of paper here contain messages. A simple and gorgeous project from the artist, JR. I wrote about his last project a little while ago. Everyone is challenged to use black and white photographic portraits to discover, reveal and share the untold stories and images of people around the world. These digitally uploaded images will be made into posters and sent back to the project’s co-creators for them to exhibit in their own communities. People can participate as an individual or in a group; posters can be placed anywhere, from a solitary image in an office window to a wall of portraits on an abandoned building or a full stadium. These exhibitions will be documented, archived and viewable virtually. Josh posted on Candy Chang‘s last project, I Wish This Was, late last year and it was really inspiring. Such a simple gesture is such a powerful tool for re-imagining a community. 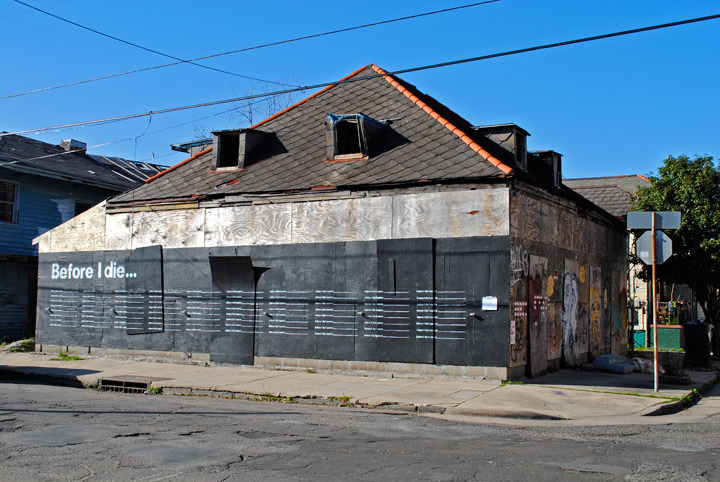 Today, I saw Chang’s latest project, Before I Die in NOLA — another lovely participatory public art project. Perhaps not quite as transformative as I Wish This Was, but the density in this project perhaps makes up for it. I found this post not too long ago and have been wanting to make one of these ever since. 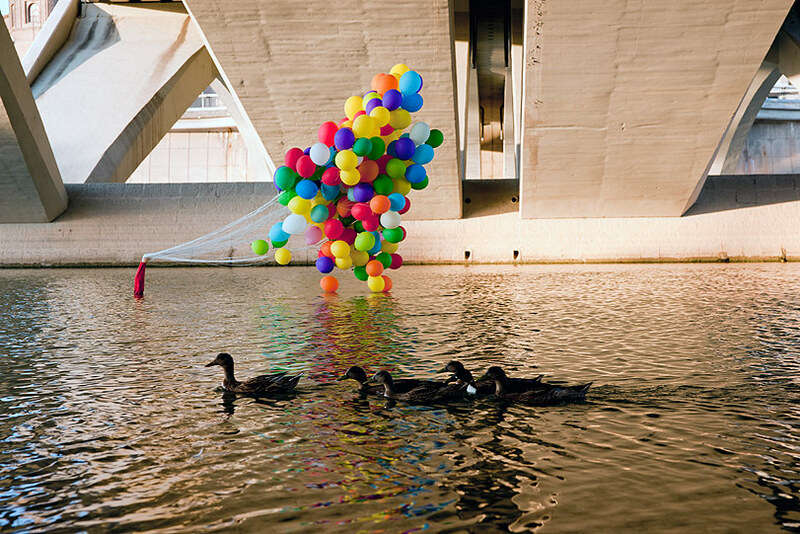 What’s making these balloons glow is the pollutants in the air around them, with colours ranging from green (signifying excellent air quality) to red (poor air quality). Choose your words carefully. 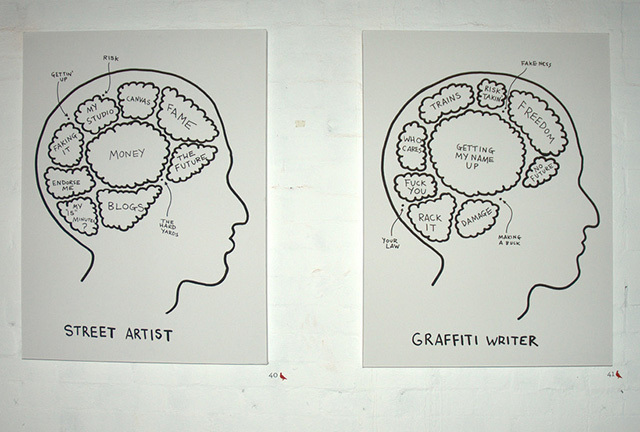 Street Artist vs Graffiti Writer by Lush. The public art works of Ceyetano Ferrer are quite stunning on first glance. The optical illusion he creates seems at first impossible and mysterious, though the process is as “simple” as placing a well-planned sticker on to a surface. As far as “street art” goes, this very much falls in line with the guerilla style shock and awe that makes the genre so exciting and valuable in a certain sense of subversiveness.